A unique international study has found that the grammatical structures of language can influence children's early understanding of numbers. The joint research between the University of California at San Diego, UCL, King Saud University, University of Nova Gorica and Massachusetts Institute of Technology looked at the importance of language in the development of young children's understanding of numbers in Saudi Arabia, Slovenia and United States. 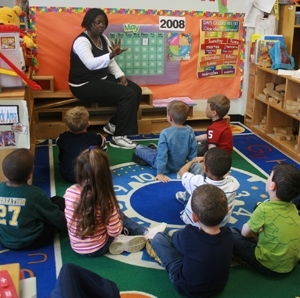 The researchers examined children between 2 and 4 years old to see the extent of their understanding of number words. They found that children taught in languages using dual markers when referring specifically to sets of two are much more likely to be able to respond to the instruction "Give me two," than those who use languages with just a singular and plural. The findings emphasise the importance of using numbers in everyday language as a driver of children's mathematical development. Alhanouf Almoammer (MSc Neuroscience, Language and Communication), first author on the paper from UCL said: "Our cross linguistic study found that 2-4 year old children speaking languages which grammatically mark duals such as Saudi Arabic and Slovenian- where 'car' can be pronounced as either 'car, car-dual, or cars' - learn number 'two' earlier than their English speaking peers who lack dual markers in their language. "We found that Slovenian children were faster to learn one and two, despite the fact that English children appeared to receive substantially more training on counting and number words in their daily routines." The research is striking given the different cultural contexts within which Saudi-Arabic and Slovenian children are learning. Dr Chris Donlan (Senior Lecturer in Developmental Science), supervisor of the study at UCL said: "The research is striking given the different cultural contexts within which Saudi-Arabic and Slovenian children are learning. The findings emphasise the importance of children's experience of number within natural language, outside the counting routine that we often prioritize. "An interesting aspect is that the investigations were completely independent. The chances of two groups studying such a rare and specific aspect of grammar simultaneously in two very different languages must be tiny. So to then find closely matching findings is both amazing and persuasive." The study was published in the online edition of the Proceedings of the National Academy of Sciences (PNAS). Image: School children in a mathematics lesson.